We are filling bags of powder on a 6 head filling machine and require to record each bag weight as it comes off the filling machine. We would like to have data sent directly into a Microsoft Excel spreadsheet. An each weight recorded to be in a row. Each log file for each day to be a new spreadsheet. Each new sheet is to be labeled as the day of the data recording. Typically there will be approximately 1000 recorded data entries for the production for the day. We only require the "date" and "head weight" figure to be inserted into the spreadsheet. All parser items are now ready for export to "Local database" plug-in. 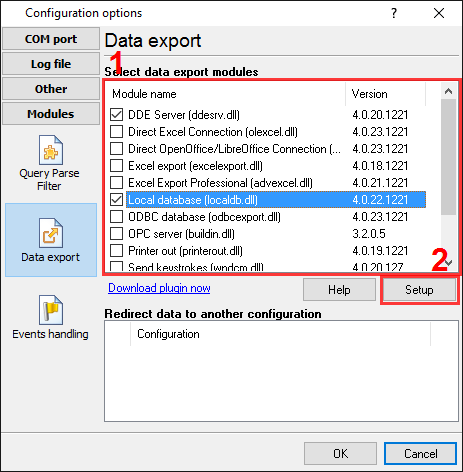 Please, open the configuration window of the "Local database" plug-in (fig.1 and 2) by selecting the module in a list and clicking the "Setup" button on the "Data export" page. Fig.1. Export to Excel. Selecting a database. Fig.2. Export to Excel. 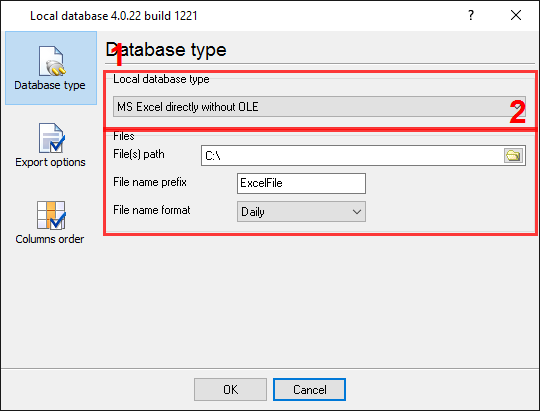 Selecting a database. 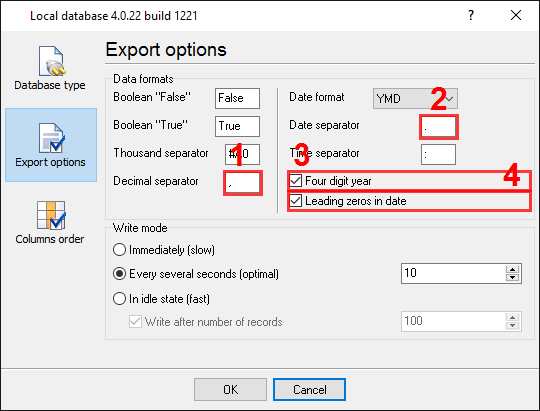 Just select a database type in the field #1, in the field #2 type or select a path, where new files will be created and specify a file name prefix in the field #3. On the next tab, you should specify basic format options as per fig.3. Fig.3. Export to Excel. Format options. Because one of our variables has the "float" data type, then we should specify a necessary decimal separator in the field #1. The next variable has the "time" data type, therefore you should specify a time separator in the field #2 and the option in the field #3 too. The option at the pos.3 allows you to add leading zero before hour, month or year digits. Other options are unnecessary in our case, because we don't use other data types. On the last page "Columns order" (fig.4) you can specify, how our variables will be being placed in a spreadsheet. Because we need 2 variables only, therefore, please, create 2 items on this page by pressing the "Add item" button (fig.4, pos.1). Fig.4. Export to Excel. Column order options. Any new items may be added by clicking the "Add item" button (Fig.4, pos. 1). Before adding an item the program will ask you about an item description. You can type any characters here, which will help you to remember a variable's content. For this example 2 variables with their corresponding descriptions have been added. 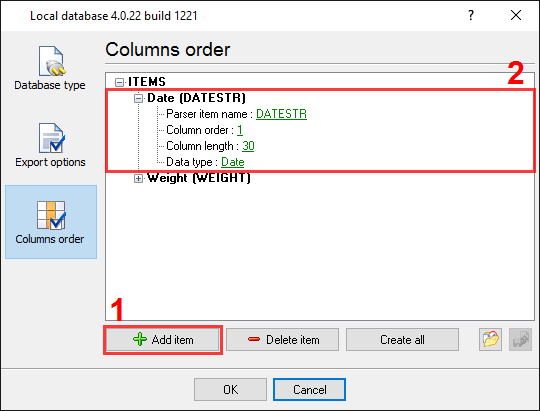 Column length - is a column width in a spreadsheet. You may change this width in Microsoft Excel later. Click the "OK" button and close the local database plug-in configuration window and the "OK" button in the options window. Okay, all settings have been completed and we are ready to capture weight data from scales to an Excel file.